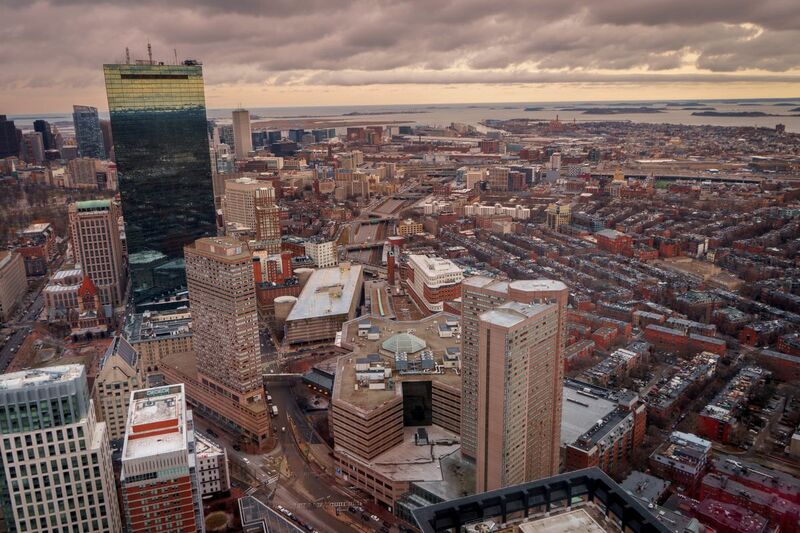 Major Boston Developments: 9 Projects Transforming The City. Boston is famously in the midst of a building boom—and not a moment too soon given the cost of housing in the city. Here are nine major projects under construction that are not only transforming Boston’s built environment, but providing a real-time gauge of its real estate. How these go, so will likely go the commercial and residential markets overall. Developers Meredith Management, Gerding Edlen, and TH Real Estate officially broke ground in late January 2018 on the five-building, 1.1 million-square-foot Fenway Center where Brookline and Commonwealth avenues meet. The groundbreaking capped veritable eons of planning and readjustments for what’s become one of Boston’s most anticipated projects. Lead developer John Rosenthal of Meredith had been trying to build at the 4.5-acre site for nearly 20 years. The infrastructural alchemy inherent in the project, which includes building over the Mass. Pike, as well as financing challenges had delayed it interminably. All totaled, it’s expected to have around 650 housing units, 160,000 square feet of offices, 50,000 square feet of retail, 1,290 parking spaces, community space, a daycare center, bicycle storage, and a bike-share station. The first phase includes two apartment buildings with 313 units total. The Four Seasons Hotel and Private Residences One Dalton Street—a.k.a. One Dalton—is almost finished, according to developer Carpenter & Company. Workers with Suffolk Construction have raised the condo and hotel tower to its 60th floor and have been adding about one and a half floors per week. That means it will soon reach its 61st and final floor any minute now. When all is said and done, the 742-foot property will be the tallest new tower in Boston since 200 Clarendon opened in 1976. It’s already the city’s third-tallest building. And, due to myriad reasons that include construction costs, a dearth of sites, and shadows, One Dalton will likely be the last Boston tower—the last New England tower—of more than 700 feet for a long, long while. One Dalton is due to include 215 Four Seasons hotel rooms that the international hospitality firm will manage and 160 luxury condos (which Four Seasons will also service). The architect is a collaboration between Cambridge Seven Associates and Henry Cobb of Pei Cobb Freed. Cobb, incidentally, designed 200 Clarendon (formerly known as the Hancock). One Dalton is expected to top off in July, and to start opening in March 2019. Developer Boston Properties plans to build 1.26 million square feet of housing, offices, and retail over and around Back Bay Station (and to redevelop the garage at 100 Clarendon Street in the process). The Boston Planning & Development Agency signed off on the plans in November 2017, capping well over a year of wrangling, in particular because of the shadows it would likely cast. One of its three new towers is expected to reach 364 feet. Boston Properties reached a deal with opponents concerned about the shadows just before the November vote. The developer will pay $3 million to opponents such as the Old South Church to mitigate the impact and a further $3 million to an affordable housing fund that Boston runs. The project is envisioned as a kind of transformative gateway connecting Back Bay and the South End; and includes improvements to the station itself. 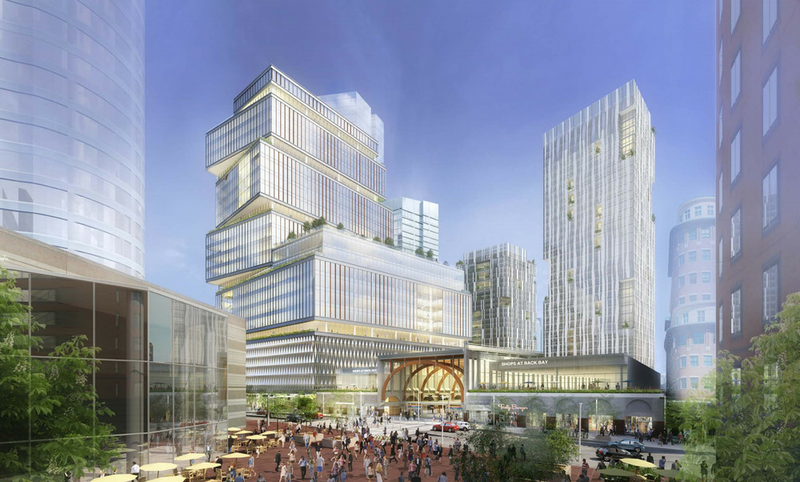 Developers Boston Properties and Delaware North officially broke ground in January 2016 on the humongous project at the old Boston Garden site. It continues to unfold and is part of a forest of new development around North Station. Ultimately, what’s dubbed the Hub on Causeway will mean more than 1.5 million square feet of shops, restaurants, offices, hotel rooms, and residences, as well as an expansion of nearby TD Garden and transit improvements to North Station. Phase II will include a 440-unit, 38-floor residential tower and a 260-key, 10-floor micro-hotel; and Phase III is an office tower with a proposed height of 495 feet. The ongoing conversion of the 2,300-space garage at 50 Sudbury Street is expected to produce 812 residential units, 196 hotel rooms, 1.15 million square feet of office space, and 85,000 square feet of retail. Interestingly, in the summer of 2017, HYM announced that 118 apartments in the project’s 45-story, 486-unit rental tower were going condo instead—likely a nod to Boston’s incandescent sales market. The HYM Investment Group, the developer behind the project, expects to finish that residential tower by 2020. The Boston Planning & Development Agency in mid-May 2018 approvedthe development of the former Winthrop Square Garage in the Financial District into a 690-foot tower of condos and offices. The building will be one of the tallest new ones constructed in Boston since at least the mid-1970s, and the BPDA’s approval caps nearly two years of back and forth on its height and scope. It was once slated to stretch to 775 feet, making it the second-tallest building in Boston—in New England—behind 200 Clarendon. As it looks now, the Winthrop Square tower will still rank among the 10 tallest in the city and the larger region. But! The BPDA wants developer Millennium Partners to reexamine the 1.6 million-square-foot tower’s size and density before it can get building permits. Whether that reexamination leads to any (other) changes still remains to be seen, though. As of early July 2018, the BPDA signoff appeared to be the tower’s last major hurdle to development. The garage itself has been demolished in preparation for construction. What will be the fourth-largest hotel in Boston got officially underway in late May 2018 with a groundbreaking that drew VIPs such as Gov. Charlie Baker and Mayor Marty Walsh. The $550 million Omni Boston Seaport Hotel will plant 1,055 rooms on Summer Street across from the Boston Convention and Exhibition Center in the Seaport District. The project goes back to 2017, when the Massachusetts Port Authority designated a development team that includes Omni Hotels & Resorts to build on a state-owned parcel in order to boost the room count in an area still underserved hospitality-wise—despite the convention center being right there. The 21-story complex will include 100,000 square feet of meeting and event space of its own, including the largest hotel ballroom in the Seaport District. Interestingly, too, six local nonprofits will share in the hotel’s profits; and the developers pointed out in the spring of 2018 that the Omni inn will create between 700 and 1,000 permanent jobs. There is one potential snag for the whole affair, which is supposed to be finished in 2020: Money management giant Fidelity Investments has sued the developers over the name. Fidelity’s own Seaport Hotel opened in the neighborhood 20 years ago. The two sides continue to wrangle as of early July. Developer Cottonwood Management officially broke ground in June 2017on this 1.33 million-square-foot project on 3.5 acres of very, very valuable land at B Street and Seaport Boulevard. Sales started about 10 months later (and the units ain’t cheap). The three-building project is set to have 717 apartments and condos. Its 447 condos will constitute the largest single amount of for-sale housing in the Seaport District. A third tower will have apartments. EchelonSeaport will include 50,000 square feet of in-house amenities—among them two outdoor pools, a fitness center, and two so-called sky lounges—and a 19,000-square-foot landscaped plaza accessible to the public and 125,000 square feet of restaurants and retail over two levels. There will also be enough parking in two garages for each condo to have one space. The towers are expected to start opening in late 2019. The Boston Planning and Development Agency in early February 2018signed off on plans for two office buildings at the site of the shuttered Suffolk Downs racetrack on the Boston-Revere line off the busy, busy Blue Line. That was the second key approval the site received toward the start of 2018, with the state expediting an environmental green light for redevelopment there. And the city’s zoning appeals board green-lighted the office-building construction shortly after the BPDA approval. Why all the thumbs-up? Because if one site in the Boston area is going to host Amazon’s second headquarters, it’s the 161-acre East Boston parcel. The area was among the 20 finalists for that second HQ that Amazon named shortly after the start of 2018. 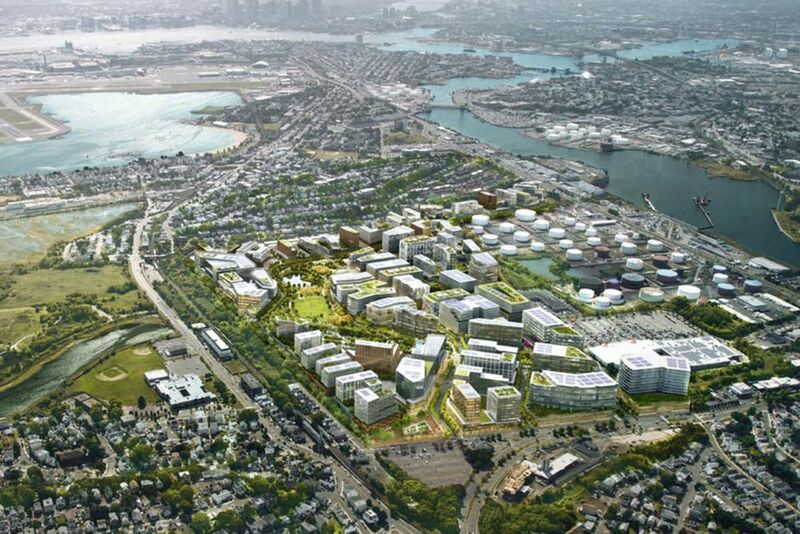 Come what may, Suffolk Downs developer HYM Investment Group plans to build big, big, big at the juicily located site, near as it is to two Blue Line stops and Logan Airport. With or without Amazon, HYM plans on 16.5 million square feet of new residential, retail, office, hotel, and lab space built out over as long as two decades. Eleven million square feet of that would go in Boston and 5.5 million in Revere. House Hunting? Here's How To Win a Bidding War. How to win a bidding war when buying a home from CNBC. Today's housing market is arguably one of the most competitive in history. A record low supply of listings, coupled with extraordinarily high demand from the largest generation, mean fast-rising home prices and more people going after the hottest properties. Bidding wars are now the rule, rather than the exception. So how do you win a bidding war? Best to be prepared before you even begin your search and to carry equal amounts of patience and humor with you … if possible. Decide on your absolute maximum price. This factors in the monthly payment on your mortgage (if you need one), property taxes, homeowners insurance, potential homeowner association or condominium fees, and a general estimate of monthly upkeep (lawn care, pool guy, unforeseen repairs). Then start looking for homes priced slightly less than that maximum. This gives you some wiggle room in the bidding war. 1. Come with cash. Not everyone can do this, but if you can make an all-cash offer, you will have an advantage. In certain very hot markets, investors are heavy, and they usually come with cash. Sellers don't want to deal with the possibility that your loan might not come through, or they may not want to wait the extra time for the mortgage processing, so they prefer cash. In some cases they may even cut the price a bit to get the cash. Coming with cash can actually double your chances of winning a bidding war, according to Redfin, a real estate brokerage. You can always take out a mortgage after the deal closes. 2. If you don't have all-cash, try waiving the financing contingency.That is when the deal is contingent on your loan being approved by the lender. Be careful though, you don't want to end up on the hook for cash if the loan doesn't come through, so get a fully underwritten loan pre-approved from your lender before submitting your offer. This could improve your chances of winning a war by 58 percent, according to Redfin. 3. Try a personal letter to the seller. I did this once myself, and it worked on a deal I never expected to win. Selling a home is just as emotional as buying one, especially for sellers who have lived in the home a long time and have raised their kids there. Sellers want to know a little about the people taking over their precious nest. If you're a young family, write about how you can see raising your children in the cozy family room and how you already envision them playing in the back yard. Write about how much you love the neighborhood and want to become an active part of it. DO NOT tell the seller if you plan to gut the home. That could gut the deal. 4. Finally, don't be afraid to walk away. The last thing you want to do is get over-emotional and overstretch your budget. Don't be house-poor. That defeats the whole purpose of the investment. And remember, there will always, always be another perfect home. Sellers: The Benefits of Staging Your Home. Professional stagers are paid to bring out the best in your home. Don't take it personally. Staging a home for sale is not a new concept, but it is a practice that has gained steam with our more challenging market. I see many home sellers confuse staging with decorating and consequently resisting the process and the recommendations of the staging professional. But the reality is that the moment you commit to marketing your home for sale, you need to commit to transforming your home into a place that potential buyers can easily picture as their home. This means that you need to be prepared to emotionally detach. Let your home speak to buyers. Your home speaks to you, but what is it saying to your potential buyer? Most sellers we encounter tend to take the staging process personally, and this is precisely the point. Our homes are personal, yet how we live is not how we sell. Our homes represent who we are; they are life-sized memory books of our travels, they trumpet our likes, our dislikes and our beliefs. They showcase our stuff -- all that stuff we have accumulated over time that speaks to us. The goal of staging is to make the home speak to everyone else, in a compelling and positive way. You are proud of your Hummel collection. Each piece acquired over time has a special meaning, but to your buyer, it is a collection of your things which serves only to draw his attention away from the main event. Likewise the personal photos, the too-tall centerpiece, the overstuffed china cabinet and the bookcase filled with National Geographic magazines dating back to the Paleozoic Era -- these are all treasures to be sure, but they serve only to sidetrack a buyer from the task at hand. Buyers tend to label the homes they see, as do agents. So, you can either be the “house with the beautiful arched doorways” or the “house with the Elvis throw rug and a bunch of office furniture where the dining room should be.” Both evoke emotional reactions, but unless the buyer is one who spends his annual vacations at Graceland, you will be far better served by eliminating distractions. Clutter may suggest your home doesn’t measure up. Most of us, if honest, will admit that our daily lives involve a certain amount of clutter. The little stack of mail and car keys and loose change next to the telephone, the “junk drawer” which has been busy propagating the species while no one was looking, and a bathroom with enough toiletries on display to groom the entire population of Northern Ireland are all examples. OK, I’m talking about my home here, but we all have our own flavors of clutter. True, clutter is just another perpetrator of distraction. More importantly, though, your clutter may be sending a message that you don’t have enough space. My own kitchen counter top is at this moment permanent home to a toaster, a toaster oven, a coffee pot, a butcher block of knives, a canister of utensils and a bowl of random items of fruit origin, the latter living out their golden years in a decorative bowl. This arrangement (except for the brown bananas) is functional, but to another person it might suggest I lack the cabinet space to properly store these everyday items. And, if I'm hoping that this other person will buy my home, I need to clean up my act. The primary goal of staging is not to transform your home into the eighth wonder of the world. For most of us, this simply isn’t realistic. Rather, the best stagers will work with what you have, rearranging and reallocating all of your belongings, in order to present the property in its best light. Sometimes this means reallocating some of those belongings to the garage. Too often the tendency is take the process personally, but you shouldn’t. Staging is not a do-it-yourself sport, and only a third party specialist can bring the neutrality and objectivity needed to accomplish the goal. You may interpret the message that your favorite painting would look much better above the fireplace -- in your neighbor’s house -- as an indictment on your style and tastes. OK, maybe it is, but most likely it is not. Rather, it is probably the stager’s attempt to ensure that your appointments don’t upstage the home itself. That’s his/her job. Make no mistake -- professional staging is an inconvenience. Your daily routine will be turned, at least temporarily, on its head. And it can be unsettling as you watch your life rearranged to suit the tastes of others. But if selling your home in the shortest amount of time and for the most money is your goal, it is precisely those "others” who should be your focus. Major projects are driving a lot of change in different areas of the Boston region—in some more than others. These are the six neighborhoods and one city everyone should be watching right now. The under-construction Four Seasons Hotel & Private Residences One Dalton Street—a.k.a. One Dalton—will be Boston’s tallest new building since 200 Clarendon in 1976. The 742-foot tower with 160 condos and a Four Seasons hotel is expected to open within the next 12 months. The neighborhood is also due to host a veritable forest of new towers around Back Bay Station. That project, which includes a redevelopment of the Clarendon Garage, is expected to total 1.26 million square feet of housing, offices, and retail, with at least one tower stretching toward 400 feet. The 30-story, 340-foot Pierce Boston condo and apartment tower, the tallest building in Boston west of Back Bay, officially opened at Brookline Avenue and Boylston Street in Fenway on March 1. Four weeks earlier, one of the biggest—and longest-in-coming—new projects in the Boston region got officially underway: The five-building, 1.1 million-square-foot Fenway Center where Brookline and Commonwealth avenues meet in the Kenmore Square area. What’s more, the Red Sox are planning to transform several lots around Fenway Park. And, speaking of Fenway Park, its famous neighbor is getting a new name. An absurd rush of new development in the South End’s northeastern reaches is transforming the neighborhood—indeed, it might be time to come up with a new neighborhood name for this area. Together, the fresh projects are adding thousands of condos and apartments, never mind hundreds of thousands of square feet of retail (and, inevitably, thousands of residents). 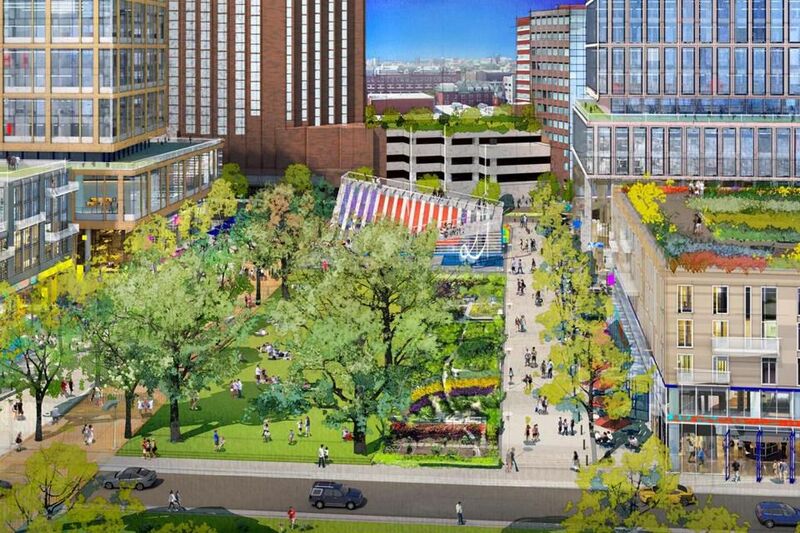 Then there’s the recent proposal for redeveloping the 5.6-acre site of the former Boston Flower Exchange. What’s now dubbed the Exchange South End would run to nearly 1.6 million square feet and contain four new buildings. These buildings would total more than $1.48 million square feet of commercial, technology, and life science research space—the idea is to rival other regional commercial hubs such as Kendall Square and the Seaport. Finally, a “millennial resort” is headed to the still-emerging Ink Block development. Don’t get more game-change-y than that. 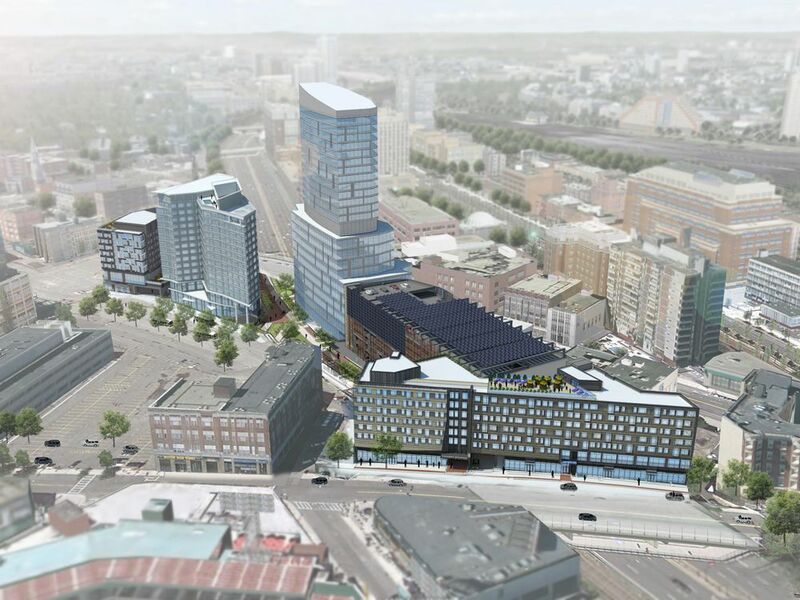 A wave of new development is sweeping much of Eastie, but no single development—or potential development—is as portentous as what’s unfolding at the 160-acre site of the shuttered Suffolk Downs racetrack. Now, should e-retail sasquatch Amazon pick Boston as host of its second headquarters, HYM would go with a so-called pro-commercial approach. That pro-commercial path would be paved with the up to 8 million square feet of office space that Amazon is seeking in a new HQ. It would, too, include 7,500 residential units, 550,000 square feet of retail, and up to 830 hotel rooms. But suppose Amazon choose Dallas or some such exotic placeinstead of Boston. In that case, HYM would take a pro-residential path, with 10,000 housing units, 450,000 square feet of retail, and 670 hotel rooms. There would also be 5.25 million square feet of office space. Kendall Square-based M.I.T. is driving much of the change in the Cambridge neighborhood. At the start of 2017, the university paid the federal government a mint to take over the 14-acre Volpe transit center site, and then floated plans for what would be, at 500 feet, the tallest building in Cambridge. 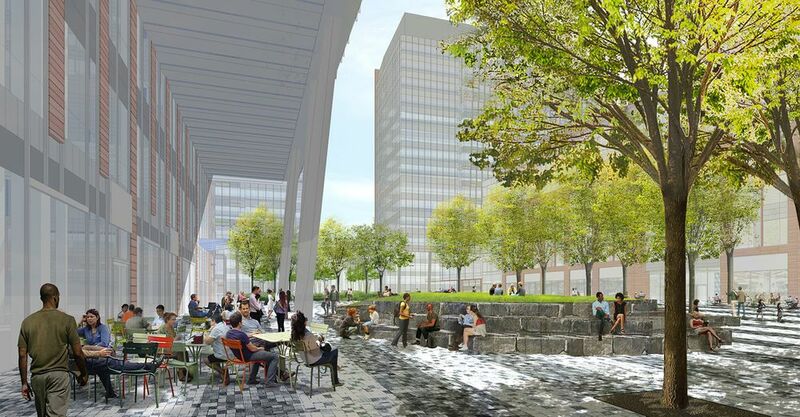 The plans, which won a key zoning approval from the city in October 2017 (and which are rendered above), also call for about 1,400 housing units and 1.7 million square feet of offices and research space as well as acres of new parkland and plazas. The university, too, plans to build several buildings south of Main Street, including a 28-story dorm. Finally, there is the bigger-than-expected 19,000-square-foot Brothers Marketplace—part of the famed Roche Bros.’ chain—that is expected to open in the summer of 2019 at One Broadway. It is part of a larger M.I.T.-driven project called the Kendall Square Initiative. 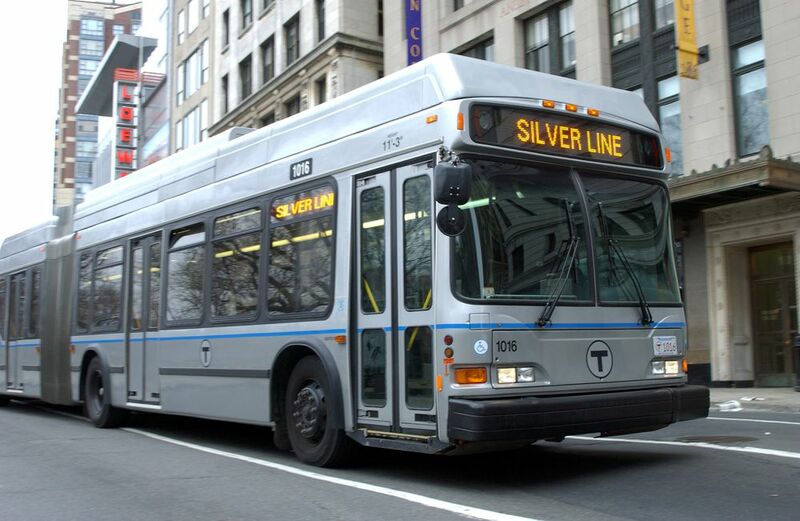 Silver Line service from downtown Boston into Chelsea is expected to start this spring. The five-mile route will run from South Station to a stop just west of Everett Avenue, and will facilitate connections to the Red and Blue lines. An estimated 8,700 people will use the route daily, a figure sure to further boost Chelsea’s status as a Plan B for buyers and renters priced out of Boston proper. The route will include an exclusive right-of-way for Silver Line buses once in Chelsea, where there will be four stops total. And, as part of the extension, the state will relocate Chelsea’s commuter rail station westward and spruce it up quite a bit. Also, there are several small condo projects going up or recently opened in Chelsea, especially in the areas closer to Boston (though with decidedly un-Boston prices). Enormous new developments around North Station and TD Garden are driving lasting changes to the West End’s streetscape and traffic. Then there’s the 44-story, 469-unit tower set to rise in place of the Garden Garage.